The goal of cavity quantum electrodynamics (cavity-QED) is to investigate and understand light-matter interaction at the most fundamental level by preparing a basic model system: a single atom strongly coupled to a single photon in a well-controlled environment. 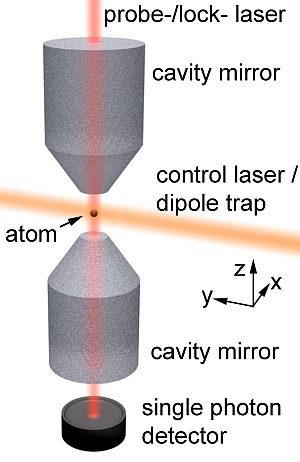 While individual atoms can be controlled well by laser-cooling and trapping techniques, photons have to be confined by reflecting them back and forth in cavities, which thus act as a "trap" for light. In such a system the physics behind spontaneous and stimulated emission of light and the associated transitions of the atom between different quantum states can be investigated and illustrated in a unique way. This becomes possible due to the strong coupling between the atom and the cavity field, enabling a single atom to control the transmission of light through the cavity, and allowing a single photon to deterministically change the state of the atom. Quantum communication could be a future application of these controlled interaction between individual photons and atoms. In our experiment we couple single neutral cesium atoms to the field of a high finesse optical resonator. Single photons can be stored for a long time between the mirrors of our resonator: A single photon is reflected 300,000 times on average before it gets lost! Moreover, the confinement of the electric field to a small volume results in a high atom-cavity coupling strength, i.e. the rate of coherent energy exchange between atoms and the cavity field. A possible goal is to couple several atoms via the cavity field and to create correlated (e.g. entangled) atomic states. If you are interested in a master or diploma project download our flyer. For open PhD positions have a look at the right side of this page.